Is the Waze Driving App Too Distracting? If you drove prior to the year 2000, you probably remember reaching for a map when you needed to navigate a route. That was the year then-President Bill Clinton made satellite signals available to the public, which paved the way for private companies to offer global positioning systems technology to regular consumers. Before that, GPS was the exclusive domain of the U.S. military. In just a decade and a half, maps have been relegated to glove compartments, and map-reading has become something of a forgotten skill. Now, most drivers in need of directions use in-vehicle GPS or an app on their smartphone. Acquired by Google in 2013 for a staggering $1.15 billion, Waze is arguably the most popular navigational app on the market. Part navigation aid, part social media platform, the app allows drivers to map their routes, alert other motorists to hazards, and even compete with each other to earn points for reporting information that could be helpful to other drivers. Users say the app is useful, but does it do more harm than good? As Boca Raton car accident lawyers, we know distracted driving is a serious problem on the nation’s roads. Is Waze accomplishing its goal of helping commuters “save time and gas money?” Or is it contributing to the already massive problem of motorist distraction? 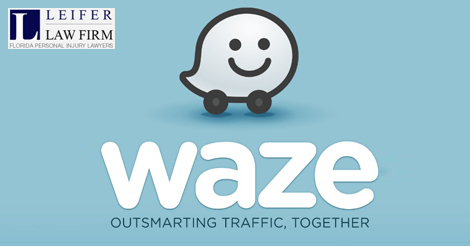 Waze bills itself as the biggest community-based traffic and navigation app in the world. Some of the app’s features include real-time hazard alerts, route navigation, construction alerts, alternative route options, and gas station pricing information. As Waze users drive, they rely on information supplied by users who have preceded them. For example, if a Waze user spots a police officer, he or she can mark the officer’s location on the road for other users in the area to see. Similarly, a user who encounters a traffic jam can note it on the app, allowing other users to select an alternative route. Waze users can also warn others about hazardous road conditions, such as wet pavement, ice, and even debris. According to the app’s creators, these are all positive features that help motorists avoid congestion, save money, and get to their destinations more quickly. On the other hand, many things about the app raise red flags. Marking the position of police: Waze encourages users to post information about the location of police vehicles. When users don’t see an officer on their route, it’s possible they will assume they can exceed the speed limit without consequences. Group navigation: Waze also allows users traveling in a group of vehicles to drive in sync with each other. This might be helpful on a road trip with a convoy of vehicles, but it encourages motorists to keep their attention on other vehicles, instead of on the road. If you’re focused on whether your friends want to stop for a bathroom break or a bite to eat, you are less likely to keep your eyes – and your mind – on your surroundings. Navigation as social media: Waze allows its users to earn points by posting information to the app’s database. This may create a friendly competition among the users on the road, but it can also pull motorists’ attention away from the important task of driving. Study after study shows that distractions behind the wheel cause injuries and fatal accidents. The Virginia Tech Transportation Institute conducted a comprehensive study of cell phone use behind the wheel. The statistics are shocking. Texting and driving makes the risk of a crash or near-crash 23.2 times higher. The average driver takes his eyes off the road for 4.6 seconds while texting. In this short amount of time, the average vehicle traveling 55 miles per hour can travel the length of an entire football field. Reaching for an object increases the risk of a crash or near-crash by 1.4 times. Apps are part of everyday life for most people. However, when they compromise safety, it’s important to weigh their benefits against the risks they create. A little extra convenience isn’t worth your health or your life. If you have been injured in a car accident caused by another person’s negligence, you may be entitled to compensation. Call a Boca Raton car accident lawyer today to schedule your consultation.